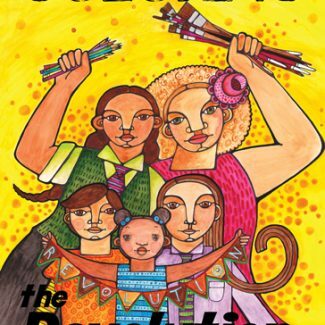 View cart “Coloring the Revolution #1” has been added to your cart. Want to see sample pages from Claiming Face? CLAIMING FACE curriculum is designed to support everyone, but especially children to engage with creativity in order to know their selves and be empowered to live their best lives. 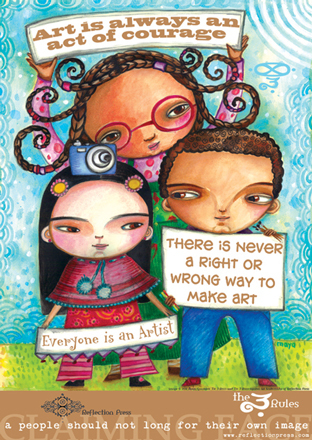 It is not about art, although art is made. It is about process. It is about life. 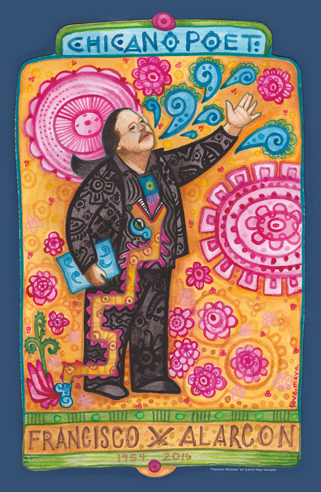 Through exploration of the philosophy and its development, imagination exercises and questions, resource materials for art and literacy, as well as a vast and diverse sense of self-portrait projects, Maya lays out a feast of creative involvement to support first the educator and then the student in the classroom. View additional free resources and sample projects related to Claiming Face, including a sample chapter here. The format of the Guide supports educators first and foremost for themselves and provides an opportunity to engage and know, from multiple levels of experience, the power of Claiming Face. Through imagination exercises and questions you bring yourself forward to personally play with the embodiment of the philosophy. Exploring and practicing presence adds another dimension to the work for yourself and for your students. Divided into 3 Parts, you will explore, in-depth, the philosophy in Part 1 of the Guide, including The 3 Rules as a distillation of the philosophy; walk through the classroom environment, materials, and books that support the curriculum in Part 2; and then delve into the 26 Claiming Face projects in Part 3. All 26 projects use a vast and diverse sense of self-portraiture to build the powerful link between creativity and a sense of self. 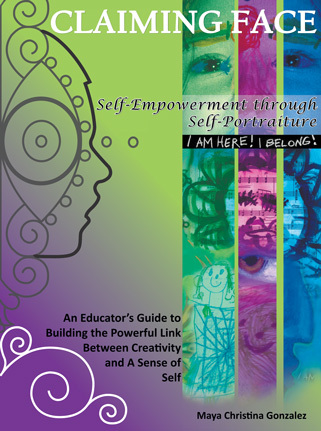 These 26 projects, organized into 6 distinctive categories of Reflection, Express, Explore, Empower, Expand, and Freedom, can be easily adapted to any grade from kindergarten to college and beyond. Maya has used these exercises with 3 year olds to 18 year olds and from student teachers to college professors. The layout and visual design of the Guide is intentionally arranged in such as way as to offer as much support as possible to the educator in their journey to bring Claiming Face into their lives and classroom. With summaries of important points, diagrams, step-by-step photographs, journal space to explore, checklists, quick reference sections for art materials and Maya’s children’s books, handouts, and a whole lot more, you can use the Guide first for yourself and then serve as a model for your students. Are you ready to Claim Face? Why is it called “Claiming Face“? Our faces are the most obvious and the most vulnerable representation of ourselves. Growing up Chicana in a sea of white faces and being called names as a child, Maya felt that the only way she could feel empowered would be if she totally claimed her face. She felt that if she claimed her own face, she was taking a step toward claiming all of herself in every deep and superficial way. In this way, her face could not be held against her, by herself nor anyone else. It is out of this realization, and the understanding of how self-portraiture had assisted her in claiming her own face and self, that the name Claiming Face settled into place. So the Claiming Face curriculum teaches my student/child how to draw and paint? Not necessarily, our curriculum is not about teaching a child to draw a chair that looks like a chair. 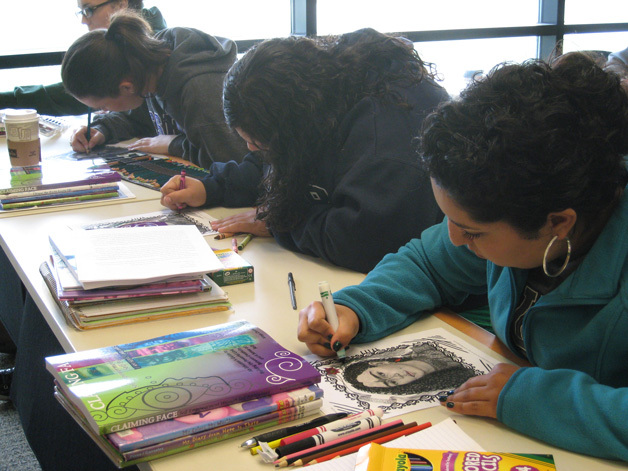 While art skills will most likely develop through engagement with our curriculum that is not the primary goal. Our curriculum is about engaging the child in the creative process and allowing that child to explore and express that which is often non-verbal through carefully designed yet simple projects. 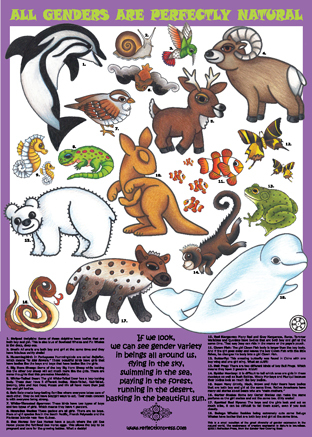 At the end of the day a child could draw something that some might label as “hideous” or “ugly,” that’s not the point. The point is that they are learning to use creativity to journey within and be present with themselves and to create their own reflection on paper for what they need in that moment. Where can I get more information about “Claiming Face” and implementing it in my classroom/school? You may wish to view Maya’s Curriculum website for more in-depth look at Claiming Face including educator trainings. Also, take a look at our free resources related to Claiming Face. I want to extend my deepest appreciation for the training class with Maya Christina Gonzalez. It was just a wonderful experience for me as a mother, artist and teacher. So many important points were discussed regarding children’s self esteem and feeling like they belong in our world and to participate in our society. I’ve always taught with the underlying intention for children to recognize their place in our world and to feel great about themselves on all levels. Maya has developed a great program that I can use in my classroom. In reading her Claiming Face, I feel so blessed, because she has laid out everything I’ve been desiring to teach in my heart. I absolutely loved the discussion she had on the history of our country, cultures and the differences that must be understood and addressed when we teach children of other backgrounds. 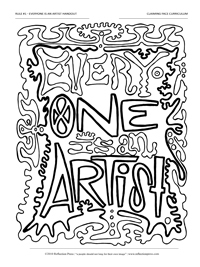 As an African American artist, I’ve always known this to be true. Maya’s elaborating, writing and integrating it in her lessons, is just what I need to allow my own creative way of teaching to expand. 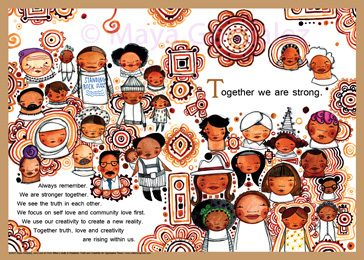 As artist, as she discussed, we need to share what we have sown. By working together, we can develop our techniques and skills. The books that she has written are just perfect for the children on the Central Coast!!! I intend to use them along with “Claiming Face Educator’s Guide” and saving the earth, recycling etc in the upcoming classes. Presently, I’m studying her Educator’s Guide she so lovingly gave us. I cannot put it down!!! Many thanks to you Laurie for bringing to the council uplifting lessons for us to learn and expand our own ways of thinking creatively and thereby inspiring our students. I look forward to being PRESENT and REFLECTING with the children of Gonzales Elementary School. Let Color Inspire Your Life!